Hybrid storage solutions are designed to provide the speed of solid state drives (SSD's) with the efficiency and cost advantage of high capacity hard disks. Drobo's architecture leverages the very best that flash and hard disk drives have to offer in a solution that delivers an amazing combination of capacity, performance and affordability. 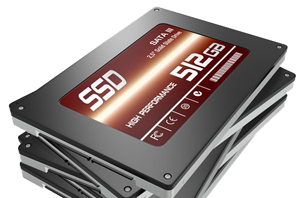 While pricier, SSDs can have 100 times greater performance, give you almost instantaneous data access, faster file transfers and an overall snappier experience than standard hard disk drives (HDDs). To get the most out of expensive SSDs, the solution must be intelligent and automated – enter Drobo. You can easily gain the performance you need by adding flash to your Drobo without sacrificing your overall capacity. On the B1200i there are enough drive bays to insert SSDs into the Drobo while still achieving high capacity with hard disk drives. On the Drobo Mini, 5D and 5N there aren’t enough drive bays to efficiently create two tiers of storage, so we’ve added a Drobo Accelerator Baythat accepts an industry-standard mSATA SSD. On those Drobo systems, the mSATA SSD is used to accelerate smaller and random reads from the Drobo, while the HDDs are used for storing and streaming larger data such as photos, videos, and user documents. 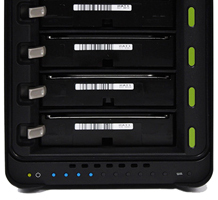 Drobo is smart… and with Data-Aware Tiering, Drobo is even smarter. Available on the Drobo B1200i is a completely automated method to affordably use a combination of solid state drives (SSDs) together with your hard disk drives, accelerating application performance. 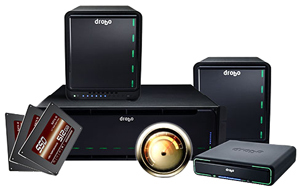 Drobo will automatically self optimise to leverage the performance of the SSDs and the capacity of the hard disk drives. All you have to do is put the drives in and Drobo takes care of the rest. Since a little bit of high-speed flash goes a long way to accelerate your storage, we’ve given you the option to add an SSD to your Drobo. Hot Data Caching with Drobo effectively uses SSD technology to accelerate applications like Aperture, Lightroom, iPhoto and iTunes. If your Drobo Mini, 5D or 5N only contains HDDs, but your applications need even more performance, all you have to do is introduce an mSATA SSD to the Drobo Accelerator Bay. 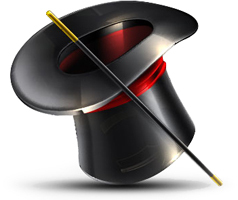 The mSATA SSD allows the Drobo to read the cached data much faster than if it had to read the same data directly from the hard drive.